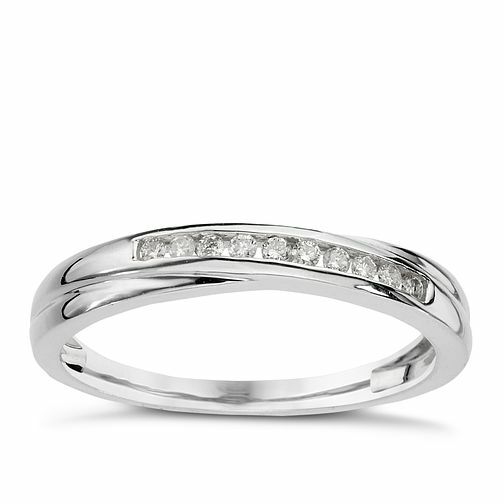 A stylish and elegant 9ct white gold crossover ring, embellished with delicate round diamonds. A beautiful ring with a unique twist, perfect as a gift for a loved one on your anniversary, or as a declaration of your commitment. 9ct white gold 1/10ct diamond crossover eternity ring is rated 5.0 out of 5 by 2. Rated 5 out of 5 by Anonymous from fantastic experience in shop from a very attentive and helpfull lady I have to say that the experience in the shop on the day was excellent with the young lady I dealt with. Very attentive and helpful, it was actually easy to part with my money. Rated 5 out of 5 by Anonymous from Sparkling classy eternity ring I love this ring it compliments my other rings. It's very pretty.